Why Is It Important To Maintain? You may not spare much thought to your home's crawl space, but the fact is that it has many important components that keep your house running; like pipes, cables, and even insulation. Any number of these things could be harmed if the area degrades over time from various troubles, such as a broken vapor barrier allowing in moisture. This will rust and weaken pipes to the point that they may leak more, wood will become soggy and begin to rot, and mold will wreck insulation and otherwise as well. This means lowered energy efficiency and wasted money! Mold spores can also easily get into your household and are dangerous if inhaled, so it's important to get these damages taken care of quickly. You may be able to see into the crawl space yourself to check for signs of trouble, such as standing water, wood that seems to be sagging or is discolored in spots, or insulation that is falling out of place and looks to be in bad shape. There are also indications outside of the area itself as well, such as a bad smell if you're near the entrance. You may also be experiencing allergy symptoms indoors, or worsened problems with breathing disorders such as asthma, thanks to mold and other particles making their way into your home. We Can Tend To It! Our technicians are ready to come out and get to work whenever is best for your schedule to get your crawl space like new again, if not better! We use the finest tools and material available to ensure that it's properly fixed and will last you a long time. We'll make sure the entrances are sealed properly to avoid moisture getting in, fix the vapor barrier, and can even install a dehumidifier to make certain that the area will be free of even a bit of water. Call Duct & Attic Cleaning Experts today and take the first step towards protecting your home in Houston! How difficult is it to repair the crawl space in my house? Crawl spaces are common in older houses that don’t have basements. They allow for air to circulate throughout the home and provide limited access to wiring and plumbing. If you notice cracks in the foundation or the interior drywall, unleveled floors, moldy smell, or actual flooding, the crawlspace needs to be inspected and repaired. Completing the complex repair work is not simple and requires a professional with experience and the correct tools and equipment. The job might involve removing standing water, repairing the structure, installing airtight doors and vent covers or a special dehumidifier. 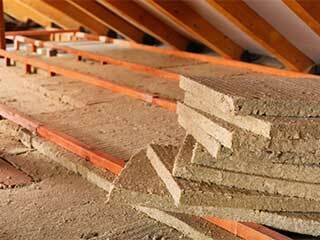 It's also possible to insulate the entire area to create a warm and dry environment.